Augmented reality is most often associated with products like Microsoft’s HoloLens or Google Glass, both of which require users to wear physical headgear to power the experience. Amazon, on the other hand, is seemingly interested in developing a solution that utilizes a stationary projector that doesn’t require glasses, goggles or a visor. The e-commerce giant was recently granted a pair of patents outliving a method for bringing augmented reality to the living room. 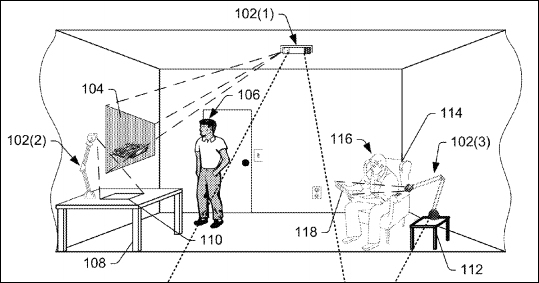 The patents, labeled “reflector-based depth mapping of a scene” and “object tracking in a 3-dimensional environment,” details a method that’d use a projector and camera to beam augmented images onto real-world objects. The system would track a user’s movement in the room, even allowing them to interact with the virtual images through gesture input (hand tracking). While it does sound neat, the idea isn’t entirely original. Microsoft a few years back unveiled IllumiRoom, a project that used the company’s Kinect motion-sensing camera and a projector to extend the reach of a television set’s imagery to the surrounding environment. The Redmond-based company renamed the project but ultimately deemed the technology too expensive for a consumer launch. Just because Amazon was awarded patents doesn’t necessarily mean we’ll see a consumer product come of it. In the technology industry, it’s not uncommon to see companies scoop up patents just for the heck of it or to prevent the competition from building on an idea they originally had but have no intentions of developing.